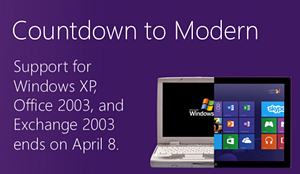 From April 8 Microsoft will no longer support Windows XP. When the XP version was released in 2001 it meant an important enhancement of Microsoft's operating system, but today we have better and more secure options. Windows XP became very popular among users, and the failure with Windows Vista made many organizations decide to stick to XP. In my opinion they should have upgraded to Windows 7 when it came, but in March 2014 Windows XP was still powering 27 % of all PCs in the world. Compare that with Windows 8 and 8.1, which only has 11 % of PC usage worldwide, and you understand that Microsoft is taking a drastic step when they end upport for Windows XP. 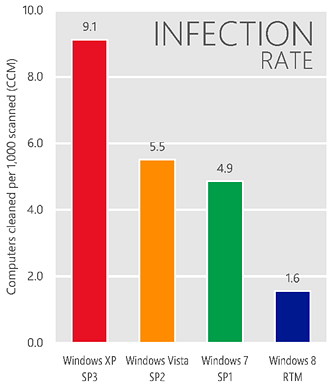 So why does Microsoft discard a product that is so much in use? Of course they want people to buy their latest operating systems instead, but a main factor in the decision is security.Windows XP cannot meet today's online threats in the same way the later Windows versions do. This security problem will increase dramatically when Microsoft stops giving new security updates. Should you still have some Windows XP machines within the organization I advice you to read the the technet blog post from which the image above is borrowed. Office 365 admins have already received a message about the ended support and its consequences for use of Office 365. Even if Office 365 will not block connections from fully patched Windows XP computers after 8 April 2014, the connectivity to the service will be at risk. When Microsoft announced the end of support for Windows XP in October 2012, I decided to stop developing for this Windows version. I knew that most of our subscribers use modern software anyway, so it would not create trouble for them. Therefore we begun phasing out Windows XP, and today the kalmstrom.com Solutions only support Windows Vista and later. Most of them still work with Windows XP anyway, but we don't recommend it. Not only Windows XP but also Office 2003 will be discarded by Microsoft this coming Tuesday, and that actually means more to kalmstrom.com. After Microsoft introdced the ribbon in Office 2007 we could take advantage of it and enhance all our products considerably, but that also made it difficult for us to continue supporting Office 2003. Therefore I must admit I felt relieved when Microsoft announced the end of support for Office 2003. Now we no longer have to spend time on dragging this no-ribbon version along. Instead we can concentrate on newer versions of the Microsoft products we build on.